MARY FEDDEN. ONIONS AND GARLIC. 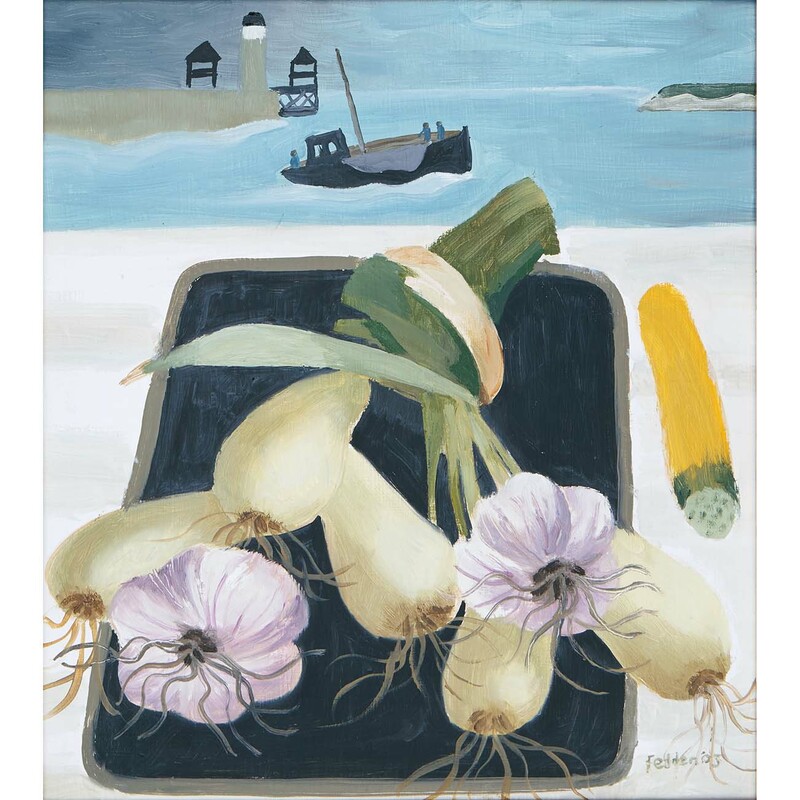 Mary Fedden’s work is often characterised by an apparently random selection of separated still-life objects placed before a landscape, or in the case of Onions and Garlic, a harbour scene. Mary Fedden cared little for the rules of perspective, or the precise depiction of objects in any photographic sense. Instead she seems to take delight in a more quirky, simplistic interpretation of her favourite subjects. 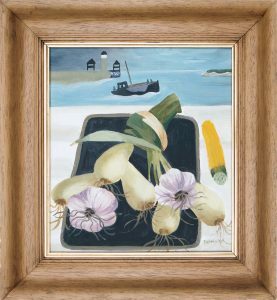 The recurring objects she paints in her pictures are themselves chosen by Mary Fedden for their intrinsic decorative appeal, in this case a bunch of onions, bulbs of garlic and a splendidly simple yellow courgette. In the background Fedden has set this tray of everyday objects in front of a quaint harbour scene, with the local fishing boat apparently gently chugging out to sea, passing the lighthouse and watch towers at the harbour entrance. Mary Fedden was a frequent visitor to the English coast, staying with friends and recording scenes of boats and seascapes in her in many sketchbooks. These scenes would then be worked into artworks when back in her Durham Wharf studio, often appearing in many different incarnations over the subsequent years and decades. WHITBY HARBOUR. 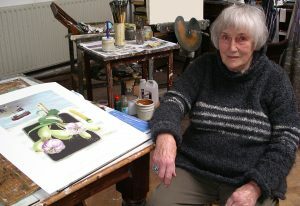 MARY FEDDEN WITH THE PRINT IN 2003. In particular, Mary Fedden loved visiting Aldeburgh in Suffolk and Whitby Bay on North Yorkshire coastline. This harbour scene appears to be a typically “Feddenesque” minimalist stylisation of the harbour at Whitby Bay. An almost identical composition entitled “Whitby Harbour” was published as a print by Mary Fedden in a limited edition of 250 (published in 2003 by A B Art Ltd). Indeed, the fishing boat in this print is named WH4 – WH being short for Whitby Harbour. MARY FEDDEN. ONIONS AND GARLIC. Available for sale – please contact us for further details. © 2018. Site by Eureka Marketing Solutions. All rights reserved.